So what do we think of all the new rules, kids? I love some of them but there are a couple that have left me a little perplexed. Grounding your club in a Penalty Area (Hazard). “Penalty Area” is a term I’m going to have to get used to I think. My initial reaction to someone telling me I was in a Penalty Area the other day was to ask “when am I allowed visitors?” No one has been in a hazard more than me and I really appreciate the comb-overs from the R&A for making it easier for me to wade out into the water without the need to carry my wedge over my head like a Navy seal skulking through the swamp. Putting the club in behind the ball adding my cute little forward press then drawing the club back might take a bit of practice though. Patting down spike marks on the green. I know everybody says this but I know for a fact I have never had a good bounce of a spike mark in my entire career. I could have easily won 4 majors with a little luck. Some might say it could be a little too late but I’m going to embrace this rule with a passion just the same. In fact I’ve bought myself a new iron to help with the process…. it’s a Sunbeam SR2300. Dropping the ball from knee height. How could they think this was fair? I’m 6 feet 4, with arms like a Tyrannosaurus Rex and a back that’s about as flexible as an Out of Bounds Stake…. I never thought I’d ever say this but I reckon I’ve got to the point where I’m going to have to sit down to take relief. 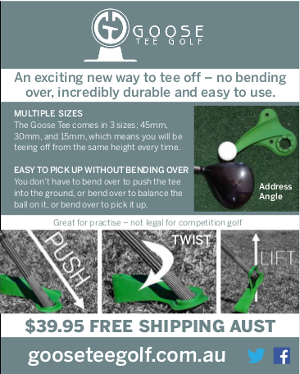 No need to hit a Provisional ball? Wow there goes the best drive I will hit during any round. Not being allowed to replace a damaged club during a round but instead it’s OK to repair it on the course. Oh yeah that makes sense. There’s always room in my golf bag for a shaft extractor and a vice. With the theme of the new rules being that of making the game easier and quicker, the one rule I thought could have been introduced would help the poor golfers who when faced with a two foot putt, suddenly transform from a reasonably normal calm person to the poor woman in the shower scene in Alfred Hitchcock’s “Physco”. At the very least just soften the anchored putting rule for club golfers. Every person I played with who used to anchor their putter onto their chest was still not exactly holing puts like Jorden Spieth. In fact most of them were pretty ordinary with the broom putter. It just allowed the poor buggers to reduce their shakes to the point where they could finish a single stroke round on the same day as they hit off and not need three playing partners to hold them down and remove the putter from their hands after leaving the green. C’Mon Royal and Ancient, you’re on the right track by addressing issues which have made the game way harder and slower than it could be. Let the yippers know they can whack the fishing gear on Gumtree and grab the clubs back out of the garage. Good job lads… Just one more rule change to go and you have nailed it. Aw come on, they obviuosly didn’t mean replacing shafts but you might just be able to get your putter back into some sort of workable condition or even a favourite wedge. Maybe you could use your teeth as a vice!